Recently, following what he called a “shellacking” for the Democratic Party in the 2010 election, President Obama remarked that “…sometimes you hit homeruns, and sometimes you have to settle for base hits…” Baseball fans know it is also possible to strike out. They may be flirting with that possibility over at the Texas Repertory Theatre where the current offering of Plaid Tidings is a considerable disappointment. I only say this because that wonderful theatre has hit home runs with so many enjoyable past productions. 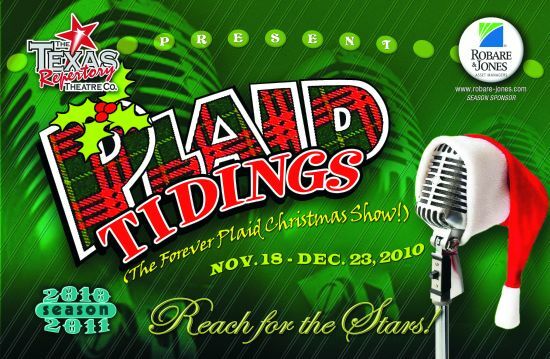 One such was the company’s delightful 2006 rendition of Forever Plaid, the production of which Plaid Tidings is a disappointing descendant. Author, Stuart Ross, should have quit while he was ahead. 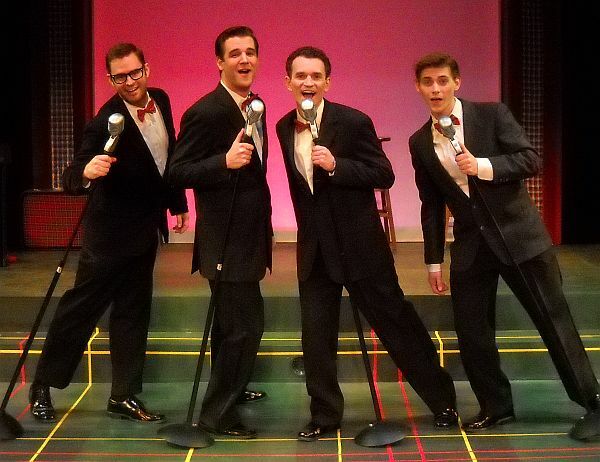 Based on the concept of the original show, the lightweight plot revolves around an ill-fated singing quartet with the vocal style of such popular1950’s groups as The Four Lads, The Four Freshman, etc. In Forever Plaid the guys are all killed in a car wreck, but are given the heavenly chance to return to earth and perform the concert they had hoped to do before that tragedy. While the script for that show was sometimes silly, the show worked well because the focus was on the lovely popular songs of the era, and that made the whole thing gel when in the hands of fine vocalists like those in the 2006 production. Not all the blame can be placed on the shoulders of Texas Rep. In this current Plaid Tidings edition, the script is endlessly tiresome and overtakes the whole idea of the music. The guys are given yet another opportunity to descend to earth for a show, but I found myself wishing they had not been given that privilege. Many lovely songs are raced through or chopped up to such an extent that no pleasure can be derived from hearing them. Add to that the fact that this somewhat vocally challenged, and perhaps over-enthusiastic cast (Joshua Estrada, Justin Michael, Mitchell Greco, and Brad Goertz), has apparently been programmed by choreographer, Lauren Dolk, and director, Craig A. Miller, to accompany virtually every syllable of every song with a constant barrage of jittery gestures, quasi-dance steps, and endless facial expressions that are exhausting to witness. On a more positive note while taking a break from my ranting above, it should be said it was most satisfying to see this increasingly popular theater at near capacity on Opening Night. In his pre-show remarks to the audience, the company’s Associate Artistic Director, Steve Fenley, displayed his usual infectious enthusiasm as he painted an optimistic future for other shows being planned at Texas Rep. I would also point out that the very pleasantly plaid set design of Liz Freese was well-lit by lighting designer, Bryan Norton; and the plaid tuxedos the guys sported were fine costume designs from Fernando Zamudio. Music Director, Luke Kirkwood on piano, and a rather dour Gerald Massoud on bass supplied onstage music, and there were musically interesting vocal moments like some Gregorian chanting “Sha-Boom” style, and a tricky number referred to as, “The Entire Christmas Canon,” featuring complex timing that must have been very difficult for the guys to master. In fairness, it should also be added that many chuckling audience members were having a better time than I. Who knows? Maybe I’m just the Grinch who stole Christmas. Perhaps readers should just go and judge for themselves. This entry was posted in Concert Reviews, Greater Houston Weekly Columns, Theater Reviews, Uncategorized. Bookmark the permalink.